MeGUI supports MPEG-4 ASP (XviD & libavcodec MPEG-4) using mencoder, MPEG-4 AVC (x264) using x264.exe or mencoder, (HE)AAC audio using BeSweet & Nero AAC encoder and MP4 muxing using mp4box. In addition, it also supports the open source wavelet based Snow codec. I edited several videos with it and I had issues with almost all of them. The program works quite well, but I agree the interface layout itself is horrible. Yeah, this is a very good tool, but you HAVE to already know how to create an AviSynth script if you want it to be of any use to you. There is no built-in cropping, resizing, editing, or filtering capability. This has to be done by you before you feed the script into MeGUI. This was a design choice. The authors chose to focus on the encoding portion of the process. I find the interface to be relatively haphazard in design despite it's immense power. The menu choices and layout could use a lot of work. But this is an aesthetic complaint more than it is one on functionality. 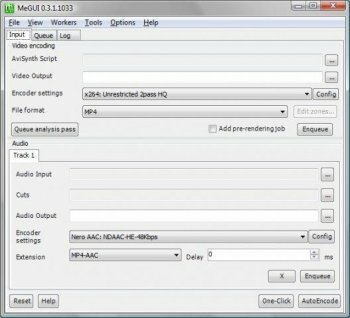 If you want the absolute best quality and consistency you can get for video encoding (especially if the tool has to be cheap or free), this is the tool to use. But you need to be prepared for a rather steep learning curve if you're new to the field or have only used completely automated tools in the past. If you're not willing to put in the time, you're better off with something like HDConvertToX.